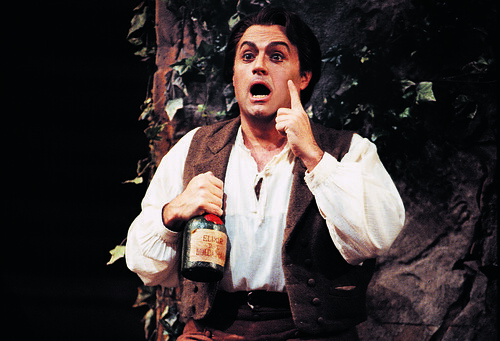 Frank Lopardo as Nemorino in Donizetti's "The Elixir of Love." Photo: Dan Rest. Double-casting opera productions can be a double-edged sword. Yes, it helps generate box office by allowing for longer runs of popular works. But while a personnel change can sometimes recharge a lackluster staging, conversely, it can serve to undermine a successful one. A large part of the wide acclaim the Lyric Opera is enjoying for its production of Donizetti’s comedy L’elisir d’amore was due to the sensational debut of Giuseppe Filianoti in the role of the lovelorn bumpkin, Nemorino. On Sunday afternoon, it was time for part deux, with a pair of new principals opening the last half of this extended run. First, the not-so-good news. While there are still funny moments, the Lyric’s second-cast Elixir of Love is not the same inspired mix of hilarity and resplendent vocalism as previously. But if the two new lovers can’t quite match the charisma of their predecessors, they still confidently deliver the vocal goods. And with the rest of the superb supporting cast, conductor Bruno Campanella, and the lively, colorful production still in place, Lyric’s Elixir remains an enjoyable show. Frank Lopardo was Nemorino in the Lyric’s last production of Donizetti’s comedy a decade ago. The American tenor’s ease and long experience in the role are clear, though he was more formulaic in his approach to the humor and less of an individual comic presence than Filianoti. Lopardo’s lyric voice has held up well and taken on more heft—enough to tackle Un ballo in maschera for Lyric next season. Yet his tenor has retained its flexibility, as with the caressing line he brought to Adina credimi. The singer delivered a lovely Una furtiva lagrima, though his registers weren’t smoothly integrated and the extreme pianissimos sounded a bit affected—more a technically deft bit of singing than the revealing character moment of Filianoti’s show-stopping rendition last month. Susanna Phillips is taking over the role of Adina, the object of Nemorino’s affections, from Nicole Cabell. The Ryan Opera Center alum possesses a rich and agile soprano and was able to tackle nearly everything the score requires, her finest singing coming late in Act 2 when Adina finally admits her love for Nemorino. Phillips was less successful at conveying the capricious girl’s vixenish qualities, though she made up for a rather bland characterization with her sweetness and infectious joy in the opera’s final scene. The rest of the cast continues to operate like a finely oiled machine. Alessandro Corbelli remains a nonpareil Dulcamara, the buffo veteran bringing comic ingenuity and a booming baritone to the role of the traveling scam-artist. Likewise, as the sergeant Belcore, Gabriele Viviani provides yeoman support, singing well and supplying the right mix of egotism and humor to Nemorino’s rival. Less hyper now than on opening night, Angela Mannino is a worthy Giannetta. Apart from a horrific botch in the bassoon introduction to Nemorino’s famous aria, the orchestra continues to play well for Campanella who shows great style in this repertoire, balancing the rhythmic vitality and lyric elegance. Donald Nally’s chorus is, again, terrific. And one last debut unmentioned previously: Bullwinkle, the white Percheron horse who draws Dulcamara’s wagon, fulfilled his assignment with the equine equanimity of a stage veteran. Donizetti’s L’elisir d’amore runs through Feb. 22. www.lyricopera.org; 312-332-2244.